Coffee shops, unlike many restaurants, allow children, have some assortment of child friendly beverages, don’t mind if we sit and hang out for a bit, or if children are wandering about unattended. The thing that I forget to consider with that response is usually how incredibly boring a coffee shop environment can be for the little humans, as well as how unfriendly small spaces often with lots of breakable merchandise about can be. Most coffee shops are not equipped or designed for little humans with a lack of entertainment for young minds, and they don’t usually offer a lot in terms of variety of beverages or snacks, particularly if you’re looking for something where they won’t wind up with a drink for a meal. So when I was chosen to write a feature for Eat In Eat Out Magazine’s fall issue, whose theme was family, I thought this was the perfect opportunity to revisit and review a place from another angle, one that I’ve only become more conscious of this past year. Thankfully for this sociable bovine, a new solution emerged for the Moo the fall of 2011, in the form of Tutti Frutti. Located on the vibrant street known as Whyte Avenue in Edmonton, AB, this self-serve frozen yogurt store offers 50 rotating flavors with 30 different toppings, with more flavors and toppings being developed at their research lab on a regular basis. At only 54 cents per ounce, Tutti Frutti offers a healthy and family friendly place for both big and little humans alike to hang out. With a bright, airy, and large seating area complete with play area, parents feel comfortable bringing the whole family and spending time there. 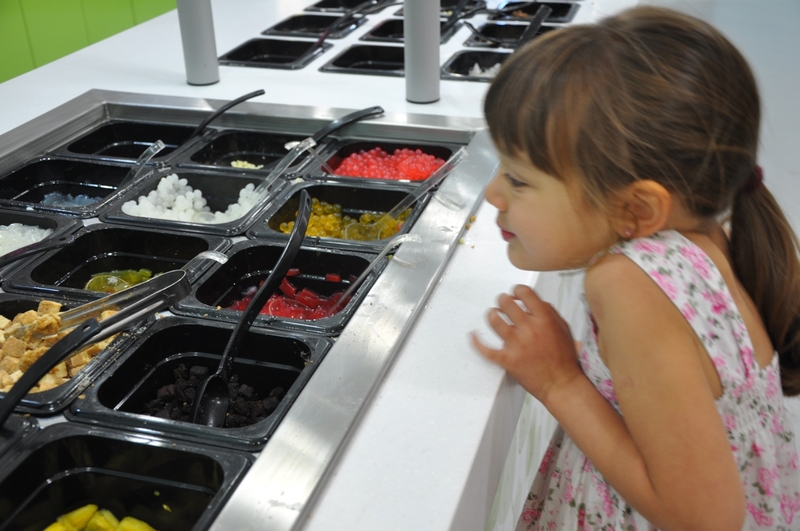 With the self-serve model, parents can offer their kids a treat more often, while maintaining the ability to control portion sizes and steer them towards healthier toppings. 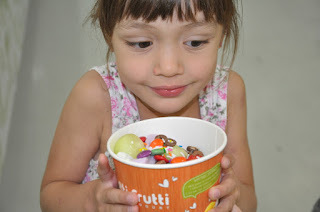 Most of Tutti Frutti’s offerings range between 25-35 calories per ounce, with the average serving for Aditi (@michpetersjones mini-me) coming out to around 8 ounces including toppings, meant that her serving of frozen yogurt was about 280 calories. Compared to an 8 oz kids hot chocolate at Starbucks, which is approximately 210 calories, and this is just the beverage and no actual food. 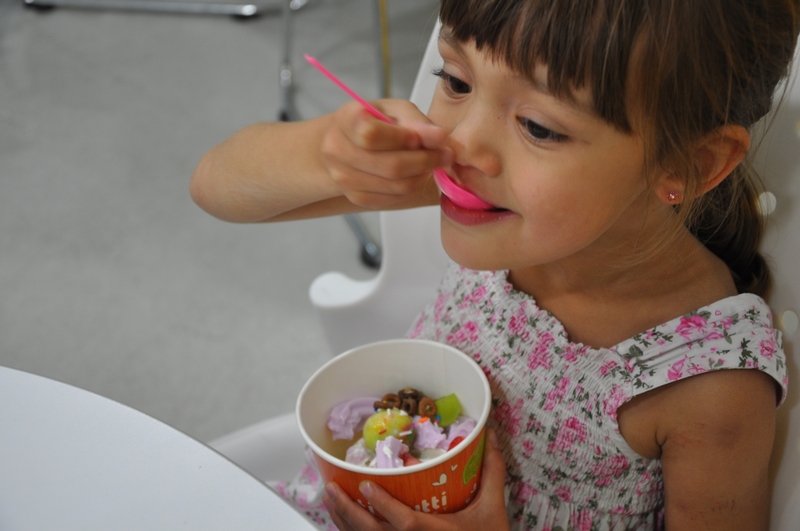 With rotating flavors ranging from the traditional vanilla and chocolate to the more exotic guava and taro, the plethora of options means kids can make creations that rival only the limits of their imagination every time they visit. From the pickiest to the most adventurous eaters, no kid can resist grabbing a stack of tasting cups and giving every flavor a whirl! 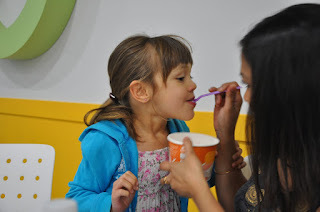 We presented Aditi with all the flavors they had available that day to discern her favorites, and the little trooper dug right in! 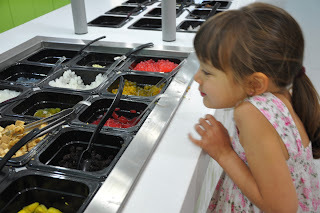 The consensus was that she was not a fan of the tarter flavors like Green Apple and TF Tart, but loved the usual flavors one would expect kids to enjoy such as more traditional flavors like Death By Chocolate, Red Velvet Cake, and Peach. The surprising thing was how much she enjoyed the more exotic flavors such as Melon, Taro, Pinapple, Mango, and Guava. For adults, the great part is the flavors of the frozen yogurt are all very natural tasting. From Strawberry Fields to Peach, none of them taste overly sweet or artificial. In fact, the fruit flavors tasted very much like the fruit they are named after, with sweetness and tartness balanced well. So while @michpetersjones and I visit and chat away, her little human can create and eat to her hearts content. When she’s done with her own dessert, she does her best to sneak some of her mom’s frozen yogurt, and play until the big humans are ready to go. Now my go to place when I need a family friendly hangout, Tutti Frutti is a hit with big humans, little humans, and faux furs alike! 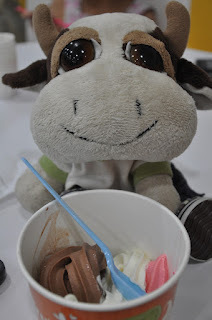 Thanks to @michpetersjones and Aditi, the frozen yogurt connoisseur, for helping me do the research on this post! Also check out @michpetersjones article in Eat In Eat Out Magazine.